Sriharshita Musunuri is on the hunt for an affordable way to detect and stop what causes sepsis, a serious immune response to infection and the No. 1 cause of death in U.S. hospitals. What’s more, she is a 17-year-old high school student in Mill Creek, a community about 30 miles north of Seattle. Musunuri’s ambitious goals have led her to work at Institute for Systems Biology under the mentorship of Chris Lausted (pictured with Musunuri, above) and with the help of a number of ISB staff, including David Baxter, Kai Wang, Zac Simon and Annie Otwell. Musunuri’s research earned her a trip to Washington, D.C. in early December as a finalist in the Siemens Competition, a premier competition in math, science and technology for high school students. There, she was awarded a $25,000 scholarship. 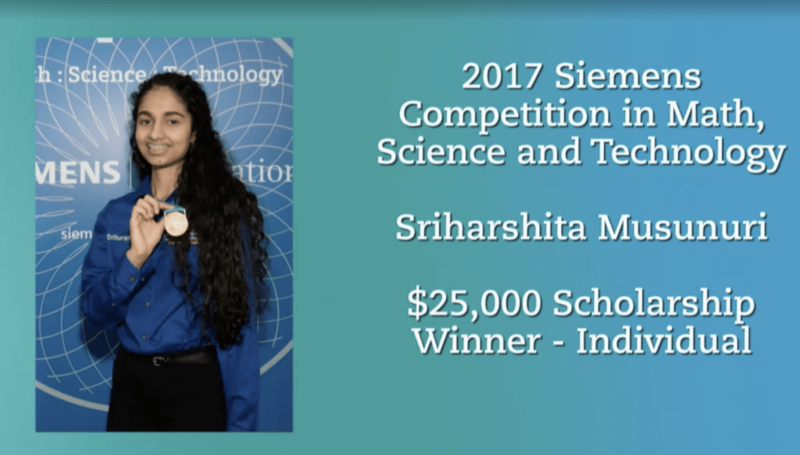 After a recent visit to ISB, Musunuri answered some questions about her research project, her experience with the Siemens Competition, her aspirations after high school, and more. ISB: Please explain the project you entered in the Siemens Competition. SM: Endotoxins are molecules released by gram-negative bacterial species including E. coli and Salmonella, and are responsible for half of all cases of sepsis, an inflammatory condition characterized by the body’s elevated immune response to infection and the leading cause of death in U.S. hospitals. Past efforts to detect and extract endotoxins effectively have been hampered by high synthesis costs, or incompatibility with body fluids. My research focused on creating a synthetic, cost-effective solution to detect and neutralize these endotoxins. I computationally designed a polymer with affinity for endotoxins by conducting molecular dynamics simulations, and experimentally synthesized them using a method called precipitation polymerization to form fluorescent nanoparticles. These nanoparticles were characterized by a variety of spectroscopy and microscopy techniques, revealing specificity toward the toxin, picomolar sensitivities, and retention of binding capacity without refrigeration. Potential applications of these novel polymers include diagnostics/therapeutics for gram-negative sepsis, and pharmaceutical solution decontamination. ISB: What was the regional experience like? How did it feel to be named a regional finalist? SM: Being named a regional finalist meant that we had the opportunity to move onto the next round of competition, and give a 12-minute virtual presentation to a panel of judges from one of six universities, followed by a 15-minute question-and-answer session. I was assigned to present through the Caltech regional finals and it was a very insightful experience because one of the judges happened to do her PhD thesis on lipopolysaccharides, so we were able to get right to the specifics. I was really excited about having the opportunity to share my research with others. ISB: You were one of six individuals invited to the national competition in Washington, D.C. What was your experience in the nation’s capital like? SM: It was an amazing experience, especially getting to know the other national finalists. We not only had the chance to learn about each other’s research, but also tour the Capitol building and compete as teams in solving puzzles at an escape room, and be interviewed by local news and radio stations. The highlight of course was the opportunity to explain our findings during the poster session and also during the oral presentations. ISB: You’ve called Chris Lausted your mentor. How have Chris and others at ISB helped you as a scientist? What does your relationship with ISB mean to you? SM: I approached Mr. Lausted about a year ago because I needed a way to characterize my nanoparticles using surface plasmon resonance; his feedback was integral to drawing conclusions about the performance of the molecularly imprinted polymers I’d made. I’d synthesized my nanoparticles in a chemistry lab at the University of Washington, but I needed to find the binding affinity of the polymers, and also quantify their size distributions and concentration, which I could not have done without the Q-nano and SPR instruments here at ISB. I’m now synthesizing a new batch of nanoparticles here, and hoping to test them using the same instruments, and Chris’ advice and assistance with carrying out these methods have been very helpful. Being able to conduct these procedures at ISB means a lot because my research would not be possible without the resources available to me here. ISB: What is next for you? How will science be a part of your life in college and as you pursue a career? SM: I’m hoping to continue my research at ISB for the following couple months. My next step after optimizing nanoparticle synthesis is to incorporate the polymers onto a fluorescence-based diagnostic tool, which I’m hoping to do at a lab at the University of Washington. Doing this research over the past couple years has taught me that I love to address issues related to human health through a combination of chemistry, biology, and computer science. I’m excited about studying these fields in more depth in college and as I pursue a career as a scientist, and do what I can to bring the tool that I’m working on closer to implementation.